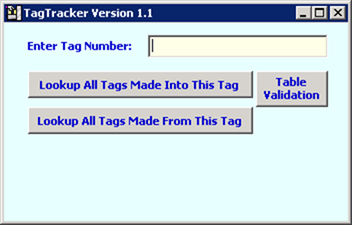 The goal of the TagTracker is to allow a user to enter a Tag number, and the TagTracker will return all of the Tags that when into the assembly of the Tag in question for all prior operations back to the raw materials. Supplier, lot numbers, date received,… all pertinent information will be retrieved. The TagTracker will also list all of the Tags for all subsequent operations that used the Tag in question. All finished goods that were made with the Tag will be listed, as well as when they were shipped and who received them. There are two otions for reports, the Dependents Report and the Precedents Report. You can download examples of both below. Note that the Dependents report example generated over 390 direct and indirect dependents beofre the finished goods went out the door. this report took TagTracker 17 minutes to render. I venture to guess that this same report using the AXIOM interface would have taken days if not weeks to generate (if you could do it without losing your mind or making multiple mistakes). There is also a report listing how many records exist in the Tagtracker table for each day over the last year. This is helpful to determine if there is missing data. 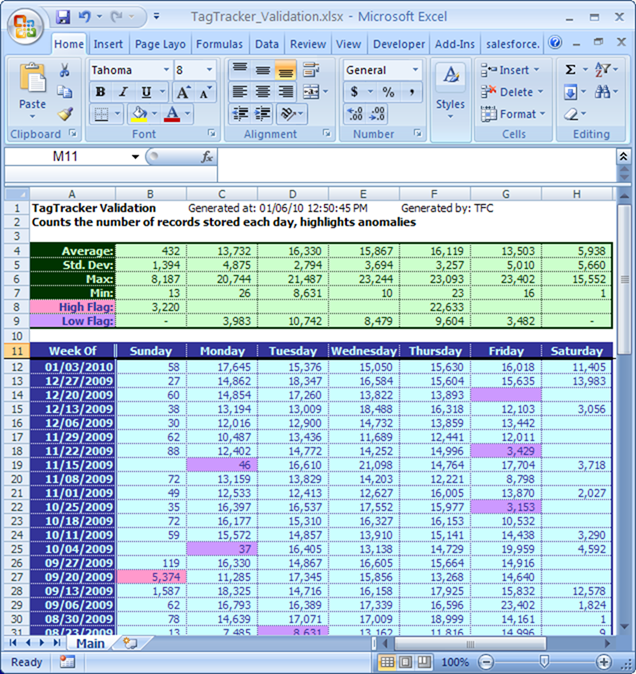 Note the color coding to alert the user to values that are not typical. Note, no activity on Christmas day.